What do we mean when we say someone ‘is blowing his own trumpet’? How can we use it while speaking Business English? ¿Qué queremos decir cuando decimos que alguien ‘está soplando su propia trompeta’? ¿Cómo podemos utilizarla al hablar inglés de negocios? 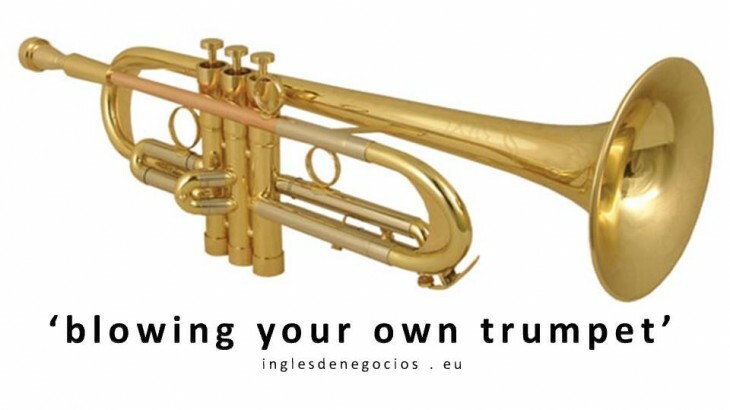 Try to come up with three sentences in Present Simple, Present Continuous and Past Continuous using the expression ‘to blow your own trumpet’, and post it as a comment at the end of this article. Leave your comment and share this article. This really gets my goat! Sin categoría aprender inglés, aprender inglés rápido, bonificada, business english, clases de inglés, clases de inglés a empresas, cómo se dice en inglés, empresa, formación, idiomas, inglés, inglés de negocios, inglés de negocios vocabulario, inglés empresarial, inglés en Granada, inglés en Madrid, inglés en Málaga, inglés en Marbella, inglés en Sevilla, inglés gratis, inglés malaga, U24Business, YouTooForBusiness. permalink. Please don’t blow your trumpet again, people are getting bored about you. Peter is always blowing his own trumpet, he could be more humble. Don’t blow your own trumpet because the result was merit of the whole team.